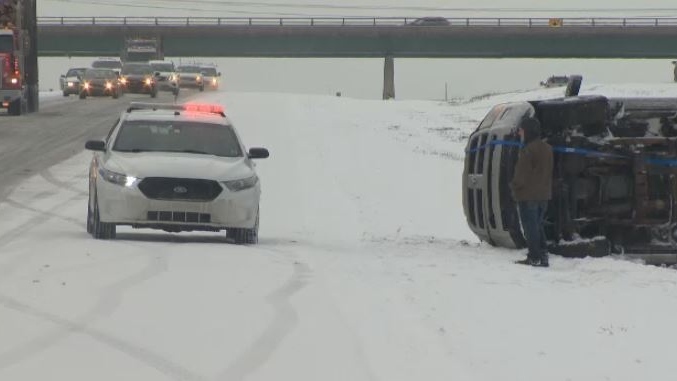 Slick roads made for a treacherous commute Wednesday morning, resulting in a number of collisions on Nova Scotia’s Highway 102. The RCMP say seven vehicles left the highway and ended up in the ditch or the median near the Halifax Stanfield International Airport during a short period of time, causing traffic to slow to a crawl. "It was really, really, really bad," said motorist Paul Ruggles. "The RCMP were out in force and several vehicles off the road. I hope nobody was hurt or, you know, suffered any physical injury, but it was pretty scary with the rush hour." There are no reports of any serious injuries as a result of the collisions. The Department of Transportation and Infrastructure Renewal said Wednesday morning that crews were out salting and plowing. 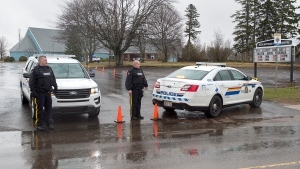 The RCMP were warning motorists about slippery roads and asking them to slow down. The Halifax Stanfield International Airport was also warning travellers about traffic delays near the airport, and advised them to allow for extra time. A number of vehicles slid off Highway 102 during the morning commute on April 10, 2019. Roads were slick after a spring storm.